Don't "they" say that if you are trying to sell a home, bake some bread and it will cause people to want your house??? True or not, who knows? Whatever the answer, doesn't it smell delicious! Yum, home baked bread. For many it isn't something they have ever considered doing on their own. After all, isn't home made bread difficult and doesn't it require a lot of work? 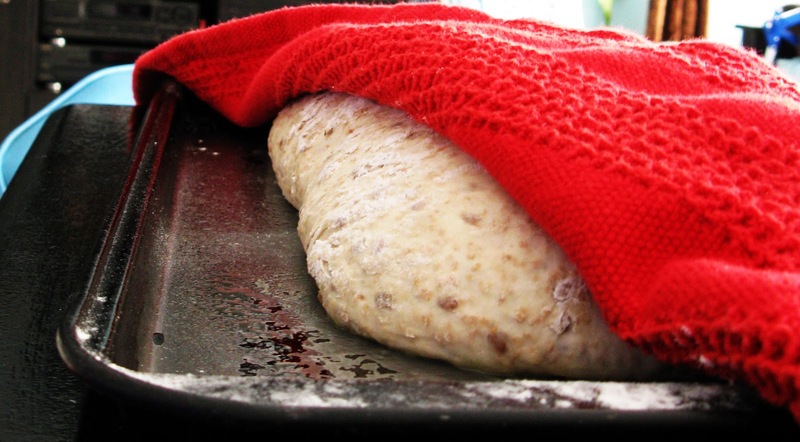 The whole kneading thing is a key part to making a successful loaf of bread. It is the formation of gluten strands, that can only be achieved by kneading. Check out this "How to Knead Dough" video, from All Recipes. As for me, the only way I would ever be able to make home made bread, was with a bread machine. Unfortunately, it didn't survive long. I suppose it was because I was so thrilled to be able to make home baked bread, pizza dough, bagels, and buns, that I over worked it! Contrary to what some believe, that a bread machine disqualifies bread from being hand made. We say, yes, we acknowledge that kneading your own bread and all that goes with it, makes it as hand made as can be. However, for those of us who use it because it is the only way to produce the closest substitute to home baked bread, we say, bake on! A Food Wish Comes True! It was over a year ago, that I stumbled upon one of my favourite recipe food blogs, Food Wishes. Without a bread machine, the possibility of bread making was impossible. Then I saw this ! Never before had I heard of bread that didn't require kneading! Kneadless to say, get it, kneadless! :o) within minutes, I was making bread. All it required was flour, yeast, water and salt and the ability to stir. Oh yes and a total of about twenty one hours. My husband and I tried variations of Chef John's recipe and none of them failed. Over and over, it worked. We eventually came up with our own version, but all the credit goes to Food Wishes. Aside from me being able to make our own home baked bread and pizza dough, my husband Craig is now the number one bread baker in our home. 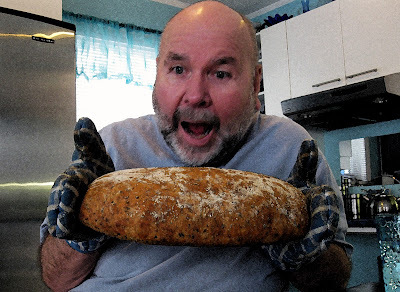 Even with his poor bent fingers, thanks to arthritis, he too, can easily stir up a loaf of bread. Click here to watch it! So whether you have limited arm strength or movement or arthritis, the No Knead or Kneadless Bread making method is for you!! It is so rewarding to know you can do something you never thought possible! Wanting to share this awesome opportunity, we have created part one of our Kneadless Bread Making video. Part two is coming shortly.